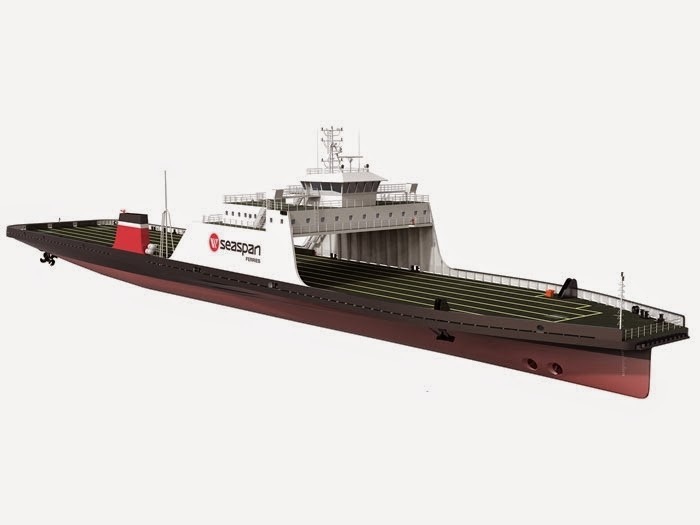 Two 148.9m dual fuel ferries ordered by British Columbia-based Seaspan Ferries Corporation from Turkey's Sedef Shipyard will be battery hybrid vessels. Under a contract just announced by Corvus Energy, Elkon Electric (an Imtech Marine company) and Seaspan Ferries, each VARD Marine Inc. designed ferry will use a 1,050 V DC, 546 kWh Energy Storage System (ESS) consisting of 84 Corvus Energy AT6500 advanced lithium polymer batteries. The ESS will be integrated with an Elkon Electrical propulsion and distribution system and will be powered by dual-fuel engines capable of running on diesel and liquefied natural gas (LNG) at speeds of up to 16 knots propelled by azimuthing drives with the Corvus ESS as spinning reserve and power source for responsive harbor manoeuvring. The ferries, both expected to be delivered by the shipbuilder and in operation by late 2016, will accommodate up to 59 trailers. Construction is scheduled to start in early 2015. The vessels will operate a drop trailer-only route between Vancouver and Vancouver Island in British Columbia, Canada. The innovative hybrid propulsion system will help reduce fossil fuel emissions and greatly improve operational efficiency. "We are very pleased that Corvus' energy storage system was selected for these innovative vessels," said Andrew Morden, President and CEO, Corvus Energy. "The two new Seaspan ferries are examples of the significant benefits both operationally and environmentally of battery hybrid LNG propulsion and it is encouraging to see this technology take root in Canada." Corvus Energy says that its lithium polymer energy storage technology is an effective solution for hybridization of commercial vessels with dynamic duty cycles, providing consistent reliable power to support greatly improved efficiency when compared to conventional propulsion systems. Corvus Energy has over 20 MWh of ESS deployed, including the largest hybrid vessel systems in the world, and says it has the breadth of experience and expert personnel to ensure this battery hybrid propulsion system performs well at start-up, and far into the future.